NASA’s New Horizons mission keeps revealing neat stuff about Pluto. The latest: The dwarf planet has blue skies and small patches of water ice on its surface. On Earth, blue skies are the result of the scattering of sunlight by gas molecules in the atmosphere. On Pluto, sunlight is scattered not by molecules but by a haze of soot-like particles called “tholins”, which are created as a result of chemical reactions involving methane and nitrogen high above Pluto. Another difference is that while Earth’s sky looks blue to us most of the time, that doesn’t seem to be the case on Pluto. 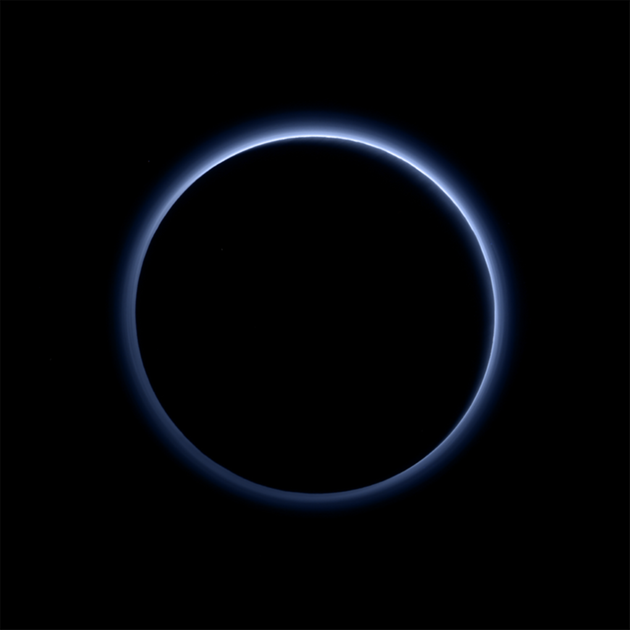 If you stood on Pluto and looked straight up, the sky would actually appear black.